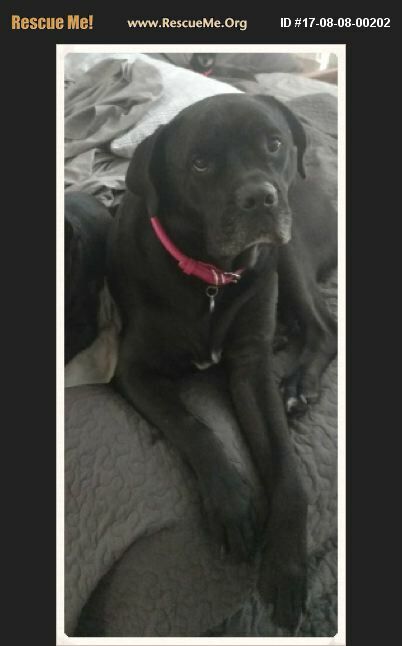 BeBe is a 4 yr old, female, 75 lb Italian Mastiff. She is a true gem and ready for a lifetime home. She loves to play with her toys, go for walks and pretend she is a 10 lb lapdog. It takes her a few minutes to warm up to new people and animals, but once she does, she is a forever friend. She is also a wonderful protector with her very deep bark. BeBe's tail is always wagging. She is super loving and you can always tell how she's feeling. Her best friend is a 20lb Boston and an 8 lb MinPin/Mix. She loves cats and hasn't been around children very much. Unfortunately, she does not get along with alpha females or other dogs that are aggressive towards her. She would do well with a mellow male dog (any size). BeBe loves to lay in the sunshine. Her personality is quite mellow and she's a low energy dog. She needs a home that offers her a safe environment, where she feels loved and protected. She loves to give and receive love and will happily flop over on her back for a nice, long belly rub. Since she is shy when she meets someone new, her new family will need to go a bit slow when first meeting her. BeBe is crate trained, however given the choice she would prefer to lay on a couch or bed. She recently had knee surgery that healed very well. $250 adoption fee includes neuter, immunizations, and microchip. For more info email savinggracefl@gmail.com or text Stefanie at 954-562-8813 to submit an adoption application go to www.savinggracefl.org.